Gnashing or bruxism is the dental term for the involuntary clenching of teeth, accompanied by dynamic lateral movements of the jaw. This can occur both during the day and during sleep at night. 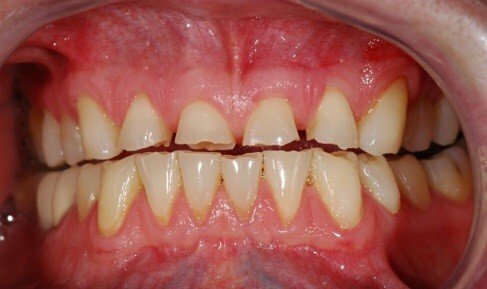 Since Bruxism is a parafunction (subconscious mode), the majority of patients are not aware that they are grinders, even when the tooth attrition is intense. In fact, when tooth clenching is not accompanied by symptoms and chipping of teeth, the patient often finds it hard to believe they are doing it. Most patients are persuaded to address the problem by their partners who hear them grinding their teeth at night. Under normal conditions, mastications muscles keep the upper jaw at a distance from the lower jaw, except during the mastication/chewing of food. All other hours of the day the mouth should be in "resting position," so that the upper teeth do not touch the lower teeth. With a thorough clinical examination, the dentist may be able to tell that a patient is clenching or grinding his/her teeth, from fractured fillings and prostheses, intense signs of attrition on the teeth, or other symptoms. 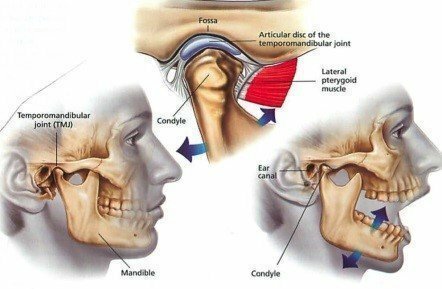 Noise and pain in the temporomandibular joint. When the mouth opens and closes, intense clicks can be heard or felt. Tooth sensitivity to hot, cold, pressure and sweets. Attrition and wear, cracks and fractures of teeth and roots can be observed in the oral cavity. Characteristic sphenoid damage to the necks of the teeth is observed. The mobility of the teeth is increased due to periodontal tissue destruction from the intense forces exerted on the teeth. During sleep, loud characteristic noises from the grinding of teeth may be audible. In children, bruxism may be a response to pain manifesting in some other area of the body (e.g. earache). It can also, as in the case of adults, manifest as a reaction to severe stress and psychological pressure. Since bruxism is largely unconscious and much related to stress, it is recommended that the patient tends to the underlying cause of his/her anxiety. Stress-relieving exercises, relaxation as well as habit-breaking techniques may help to manage the symptoms. Apart from behavioural therapies, night-time bruxism can be managed with the use of mouth guards or mouth splints. These protective splints or guards made of tough acrylic material, are placed on the upper or lower teeth. Proper construction and application of the splint makes it easier for the patient to become accustomed to. Splints are not a cure for bruxism, but they do help deal with its effects, protecting the teeth from attrition. At the same time, a splint forces all the muscles that cause the clenching of the teeth to relax, thus helps in creating a new, more comfortable "position of rest" of the mandible. The protective splint is applied systematically every night during sleep. The period of application can be from a few weeks to many months. Usually after the first few applications, the splint is well tolerated. A splint made of soft material may be more comfortable for the patient. Its construction is easier and therefore less costly, however its use is contraindicated for bruxism because it causes the opposite effect, as it works similar to a chewing gum. Reduction of chipping, fractures, and excessive wear of the teeth. Maintaining the morphology of the teeth and their anatomy, resulting in better chewing of food. 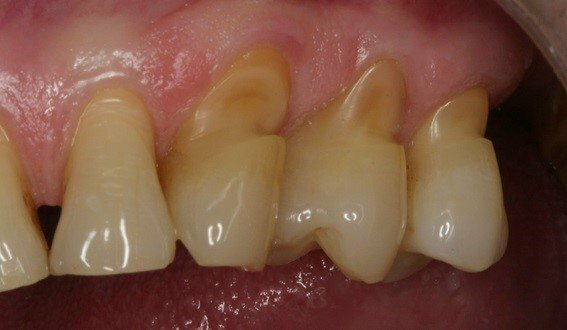 In many cases, tooth wear progressed without the patient noticing due to lack of symptoms. This leads to a particularly unaesthetic and functional problem. 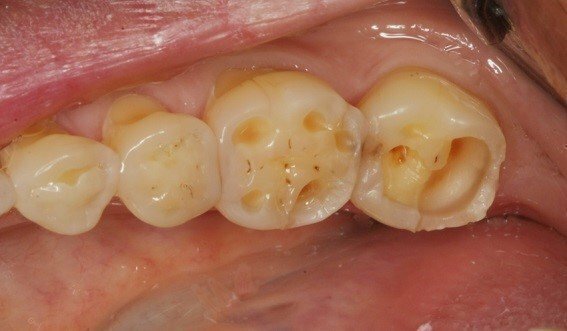 In these cases, it is usually necessary to reconstruct the vertical dimension of occlusion with occlusal bridges and crowns.